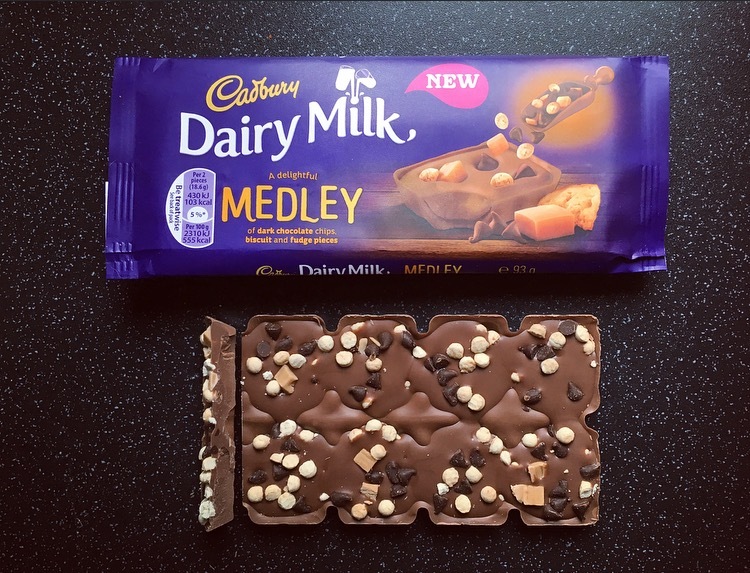 There is a new variety of chocolate bars on the block and goes by the name of Cadbury Dairy Milk Medley. 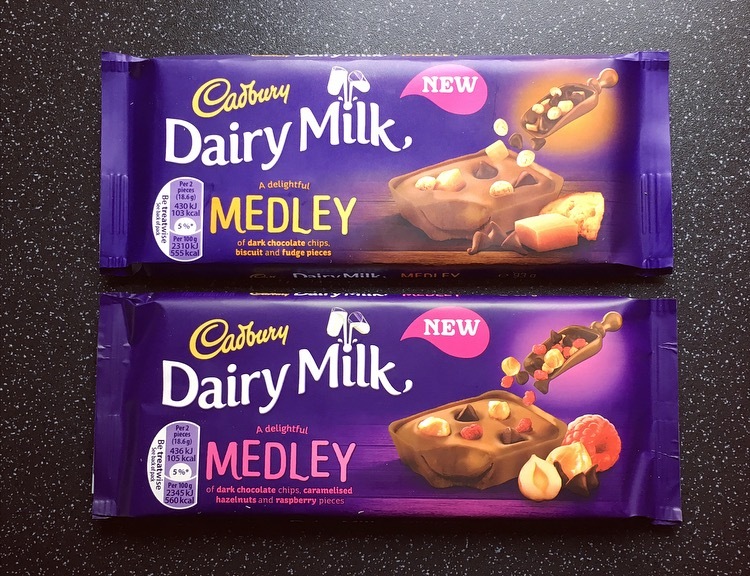 Marketed as a luxury bar for the adventurous chocolate fans wanting a new taste experience, Cadbury have devised two Medley’s to tickle our fancy, which I found in none other than my local Londis shop. 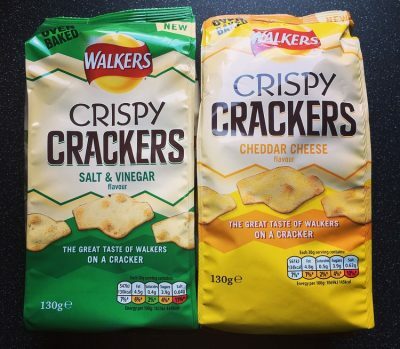 It really comes to it that our local Sainsbury’s doesnt even have these bars yet but the local corner shop does. Anyway not one to pick one or the other, both promptly went in the basket. Why are they luxury I hear you ask? Well I thought the same, Cadbury Dairy Milk and Luxury is not something I would put in the same sentence. Nonetheless Cadbury believe that the larger chunks of chocolate with luxury ingredients sprinkled on top of the bar, make just a few pieces the perfect treat. We shall see about that one won’t we. A delightful medley of dark chocolate chips, biscuit and fudge pieces. I must say the bar did look very pleasing to the eye and rather inviting. The sprinkling of toppings was even across the whole bar and looked plentiful and even. From the packet I was expecting a rather soft centre but inside was solid chocolate. The milk chocolate was typical Dairy Milk in taste, below par in comparison to the Irish version. The fudge although the lesser of all ingredients, was prominent and provided a sweet chewy texture and the shortcake biscuits were crunchy and sweet, I must say I do like the addition of biscuits to chocolate. The dark chocolate was lacking considerably, as in non-existent, and if anything is a much needed component to the Medley bar because as a whole it is incredibly sweet. What the front doesn’t tell you is this bar is milk chocolate with a chocolate flavoured creme. Well Cadbury a flavoured chocolate creme does not exactly scream luxury does it!! Overall this Fudge Medley is far too sweet and I imagine after a few pieces you won’t feel any luxury you will just feel a bit nauseous. A delightful medley of dark chocolate chips, caramelised hazelnuts and raspberry pieces. It is evident that there is inconsistency in toppings here, with one square having barely anything on it. Inconsistency does not equal luxury. Again this states chocolate flavoured creme, however the middle is more solid chocolate than a creamy delectable middle that the wrapper suggests. Taking a bite you get the sweet milk chocolate followed with an instant hit of bitter dark chocolate chips, which I love. The raspberry is subtle in flavour but a perfect addition to the dark chocolate. To be fair you can’t really go wrong with raspberry and dark chocolate. The caramelised hazelnuts are few and far between, which doesn’t bother me as I’m not the biggest fan of nuts in chocolate, however those who love a nutty chocolate will be disappointed. This is by far my favourite of the two bars. If you like sickly sweet go for the fudge. 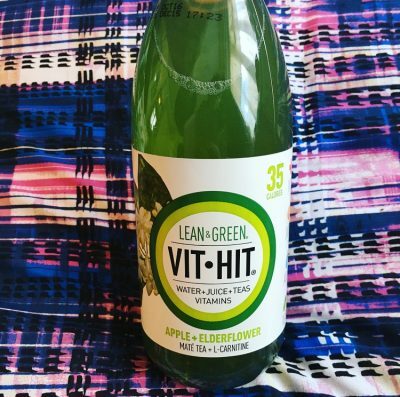 If you want something a little different Raspberry and Nut is your number. 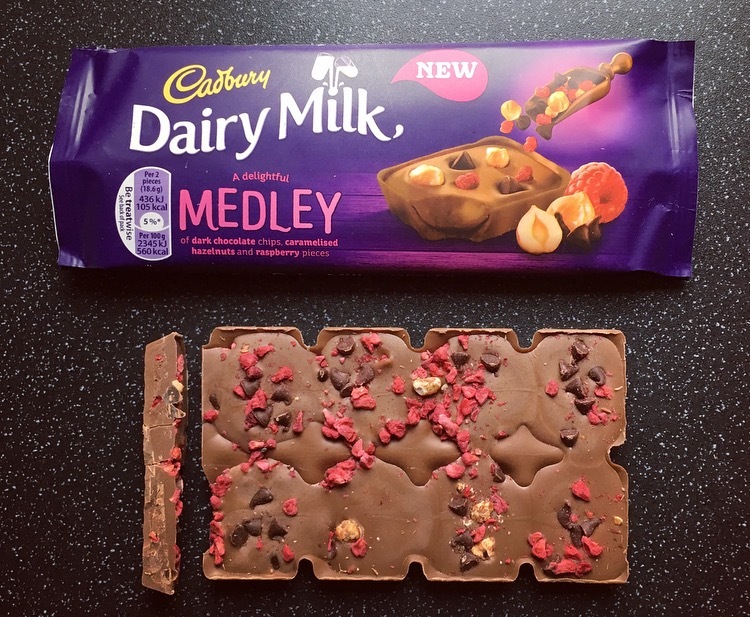 As far as luxury goes I still do not put these Dairy Milk Medley Bars in that category, nor do I think the medley of ingredients is something that us adventurous chocolate lovers are seeking for; fudge and biscuits and raspberry and nuts isn’t exactly breaking barriers. Rather than thinking of new flavours, Cadbury UK need to start addressing their milk chocolate and bring it back up to the standard of their counterparts in other countries!